Redwood sorrel is a herbaceous perennial species that is found in North America from British Columbia south to California. In British Columbia it is rarely found on the Queen Charlotte Islands (Haida Gwaii) and the west coast of Vancouver Island, in the Coastal Western Hemlock BEC zone (Douglas et al. 1999). The leaves are light-responsive, opening in direct sun and closing when shaded (Wikipedia 2012). The ecological framework information for this species on E-Flora BC shows that it is generally found at an elevation of 25 m, but may be found up to an elevation of 80 m.
Perennial herb from a scaly rhizome, 5-20 cm tall; stems ascending to erect, several, simple, brown-hairy, 5-15 cm long. 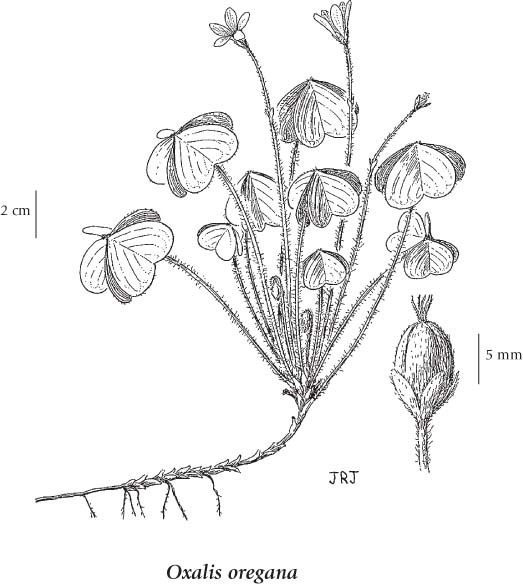 All basal, numerous, clover-like, the blades 1-4.5 cm long, stalks brownish-hairy, 3-20 cm long, leaflets broadly heart-shaped, folded towards each other. Inflorescence of single terminal flowers; petals white to pinkish, 13-20 mm long, entire; sepals 5-10 mm long. Capsules, egg-shaped, 7-9 mm long, hairy; seeds almond-shaped, 3.5-4 mm long, longitudinally marked. Moist forests in the lowland zone; rare on the Queen Charlotte Islands and W coast of Vancouver Island; S to CA.